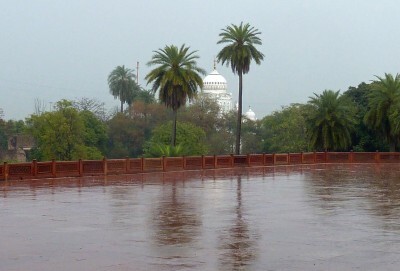 On our first day in Delhi, it rained. 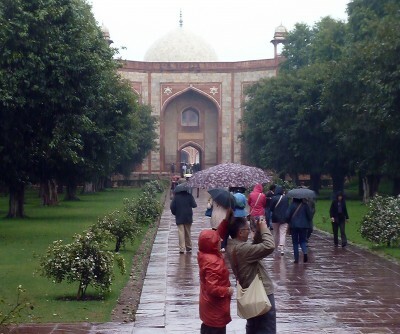 Our guide therefore decided to change the order of our visit and the first site we saw was Humayun’s tomb, in the southern suburbs of Delhi. 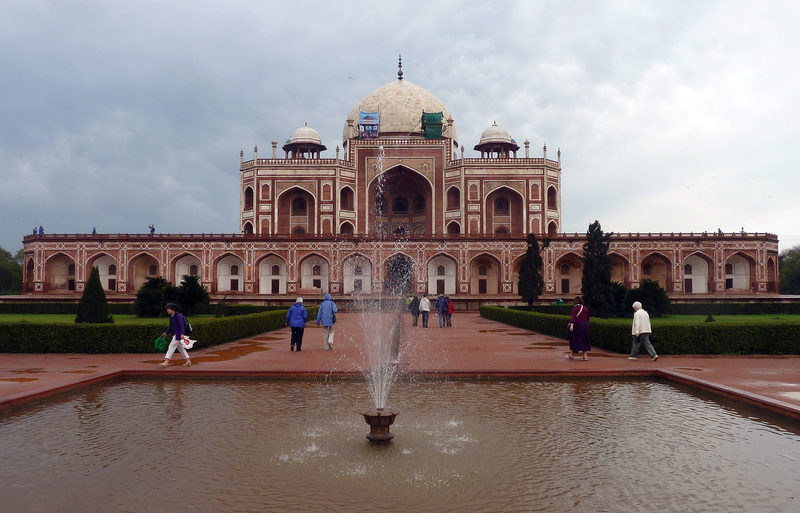 Humayun was the second of the six great mogul Emperors. He reigned from 1532 to 1556 and on his death his first and best wife, Hazi Begum built this magnificent tomb for him. It became very influential and was in many ways the forerunner of the Taj Mahal built 60 years later. 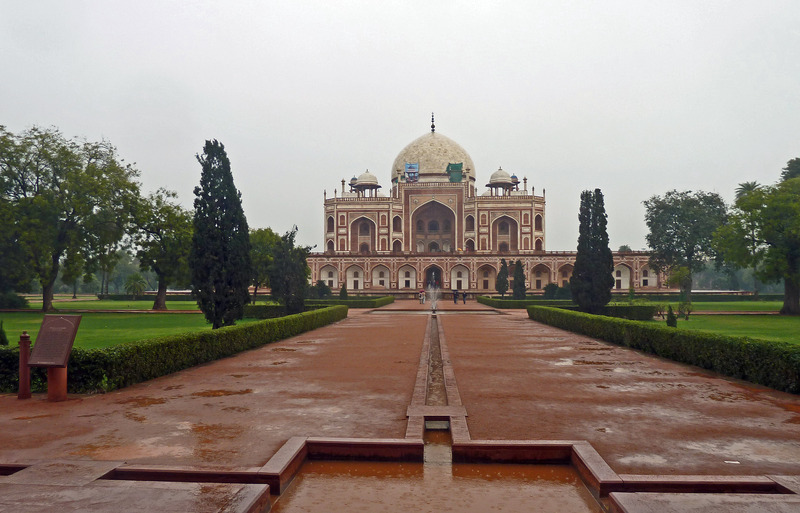 But whereas the Taj Mahal was built in white marble imported from over 100 miles away, Humayun’s tomb was built in the local red sandstone. However the intervening bands of white marble make it extremely attractive in its own right. And here is a closer view of the tomb with a fountain in the foreground forlornly adding to efforts of the rain to fill the basin. Humayun (1532-1550) was the son of the great Babar who founded the Moghul dynasty and was th e second of the six great Moghul emperors. He first came to the throne at the age of 22 but soon lost the Empire – he was prone to long periods of indolence, perhaps due to opium. Later however he was able to recover it with the help of the Persians. The influence of Persian architecture increased in his reign, and the tomb was designed by a Persian architect. A major feature is the great arch in the front which dominates the whole facade. 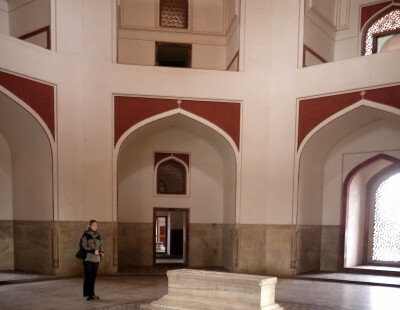 The great white dome behind displays Persian, or perhaps Timurid influence, but the two small canopies, or chhatris on the roof are an Indian feature. 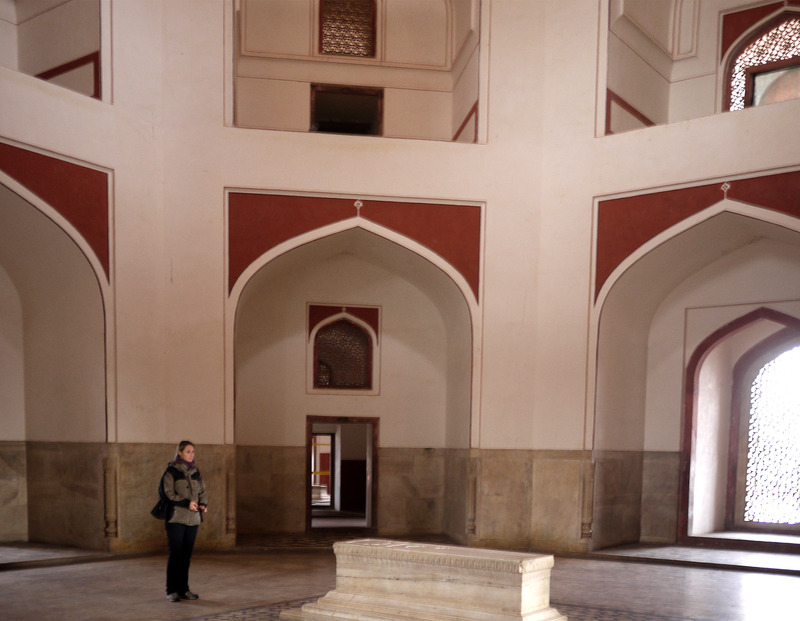 Here is the inside of the tomb with one of the burials at the centre. We managed to get up on the podium of the tomb, and cowering under one of the recesses I took this photo showing a dome in the distance and the palm trees reflected in the pools of water through which we had to trudge to get to the inside of the tomb. Here is my final view from the podium of the Temple looking back to the entrance showing the beautiful gardens in which the tomb was set. One of the major Persian influences was the use of gardens. 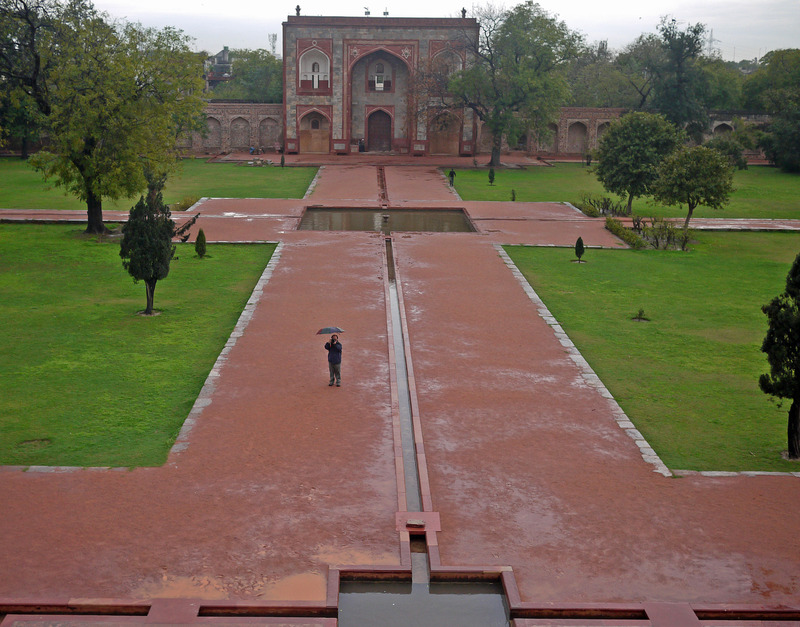 The tomb was built at the centre of a large and elaborate garden. Following the decline of the Moguls, the garden became neglected but it was restored by the British, at first in an English style, but then under Lord Curzon, it was restored to its original format. When the tomb became a World Heritage Site in 1993, the Archaeological Survey of India carried out a major restoration and excavation project funded by the Aga Khan Trust from which numerous pots were recovered.